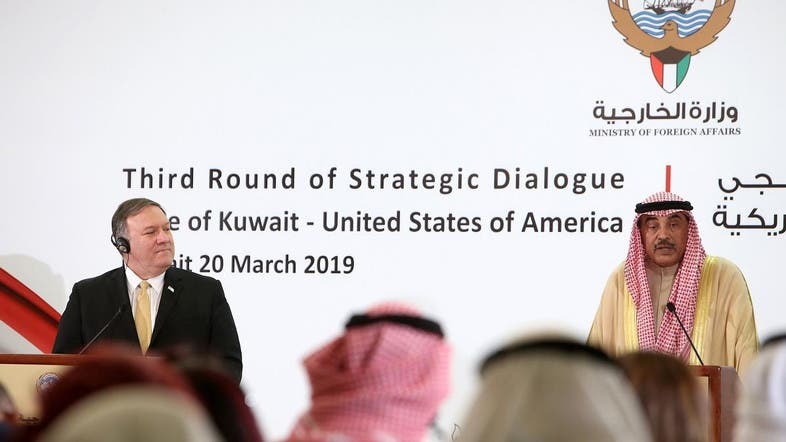 Kuwait trusts the US’s role in putting together a Middle East peace plan, and finding a peaceful solution to the Yemeni war, said Kuwait’s Foreign Minister Sheikh Sabah Al Khalid Al Sabah during a press conference with US Secretary of State Mike Pompeo on Wednesday. "We hope the plan will take into account the situation in the region and all the relevant parties," Sheikh Al Sabah said. Pompeo had arrived in Kuwait late Monday as part of a tour that is set to include visits to Lebanon and Israel to reinforce “the value of our partnerships, as well as the importance of security and economic cooperation in achieving regional stability and countering the Iranian regime’s malign activities,” a State Department statement read. Al Sabah commended the US’s “tough stance in defending the security of the Gulf,” adding that Kuwait is in agreement with Washington about the importance of solving the Yemeni crisis peacefully. “Kuwait is a longtime friend and vital partner that helps advance key US interests in the region, including defense and counter-terrorism,” Pompeo had said prior to his arrival to the country. Pompeo participated in a series of bilateral meetings with high-level officials, including the Emir of Kuwait Sheikh Sabah Al-Ahmad Al-Jaber Al-Sabah, and attended the third US-Kuwait Strategic Dialogue. In the past, the two countries signed cooperation agreements and MoUs over security, counter-terrorism, economy, trade, education, oil, custom and consular affairs. At the press conference, Pompeo said that they discussed the issues of defense, counter-terrorism and trade. The US official was expected to visit Kuwait in January during a previous regional tour, but had to cut it short due to a family funeral.